Give your property a modern edge and character thanks to the experts at Cutting Edge Stone! 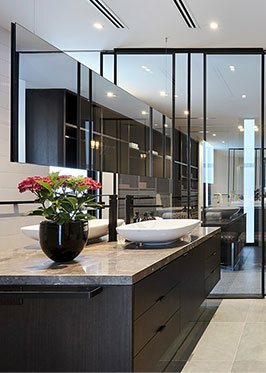 With over 40 years of varied and detailed experience in the industry our skilled and passionate team can update and improve domestic and commercial properties throughout Melbourne without wasting our customer’s money or time. Easy to maintain and durable our stone table tops help Melbourne customers improve their quality of life for less. Custom-sized to suit the dimensions of our customer’s properties our stone table tops immediately enhance whatever space they are installed in. So, if you are after cheap and reliable stone table tops in Melbourne of the highest quality look no further than the team at Cutting Edge Stone. To consult with a helpful and friendly member of our team call us on 03 9338 8440.